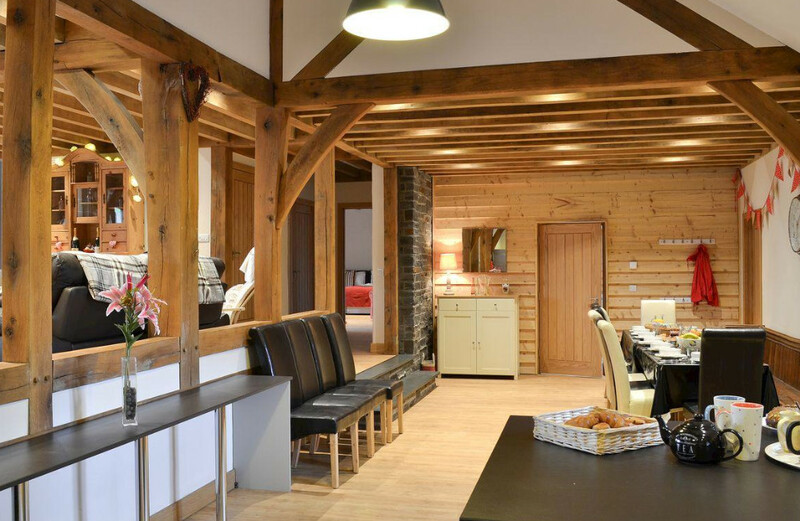 Tynrhyd Retreat is a large stone barn which has been converted into this large, luxury, holiday cottage sleeping a total of 28 people. Set in three different wings, Tynrhyd Retreat is also licensed for civil marriage ceremonies - so should you be on the lookout for a large holiday cottage to celebrate your big day Tynrhyd Retreat could be it! 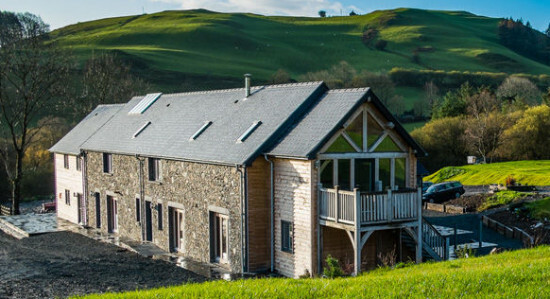 Tynrhyd Retreat sleeps 28 people in a total of 10 bedrooms. The bedrooms are mainly double bedrooms, but can be made into twin bedrooms should you require (just make your booking online, and phone to discuss the bed requirements). Extra beds can also be provided - which means Tynrhyd Retreat sleeps a total of 28 people. Should you have a dog as part of the family you'll be pleased to hear that Tynrhyd Retreat is pet friendly, which means you can all holiday together - and there is a dog exercise field behind your accommodation. Tynrhyd Retreat is split into the "left wing", "middle wing" and "right wing" - with each wing having a separate lounge and kitchen. Each wing has a bunch of TVs - with most bedrooms having their own TV. Tynrhyd Retreat has Wi-Fi too, so you can stay online during your holiday in the depths of Wales. Heating is provided by bio-mass heating, with wood burning stoves to use when the weather turns inclement. Each wing at Tynrhyd Retreat has a cooker, washing machine, tumble dryer, dish washer, fridge/freezer and a microwave. Tynrhyd Retreat has a games room with a pool table too. Outside Tynrhyd Retreat has a landscaped garden and shared 13 acres of grounds. You have a swim spa and hot tub in your garden; with a full size football pitch in the grounds. Holidays at Tynrhyd Retreat start on a Friday, with short breaks also being available. Should you want to leave the peace and quiet of Tynrhyd Retreat, head into Devil's Bridge - about 1 mile away - for the nearest pub, shop and restaurant. You can aslo catch the narrow gauge railway from Devil's Bridge into Aberystwyth! Aberystwyth is on the west coast of Wales and has a choice of pubs and restaurants. You can also enjoy summer days on the beach (or bracing winter walks along the promenade). A variety of activities can be sampled during your holiday, speak to the owners of Tynrhyd Retreat and they can help you organise various activities. The Snowdonia National Park is also a few miles up the road, and offers main outdoor activities. For a more sedate day out, you can visit the National Trust property of Llanerchaeron ("18th-century Welsh gentry estate - with house, walled gardens and home farm") for the day.